Custom websites for solos and small firms. Get yours, starting at just $99. 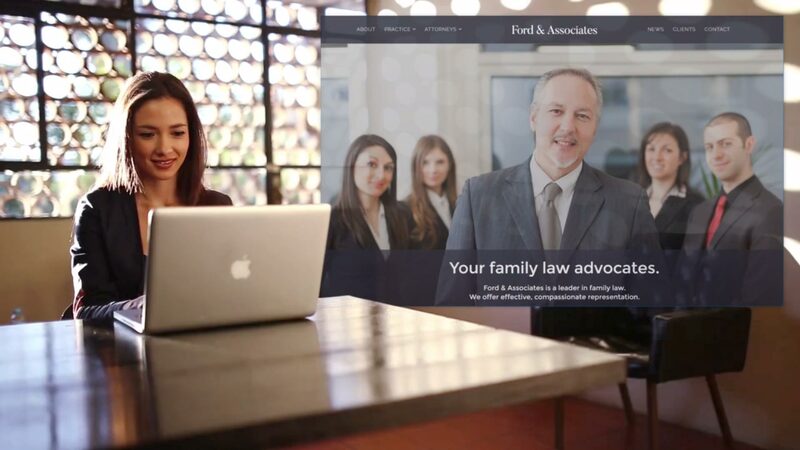 Custom websites for attorneys and law firms. 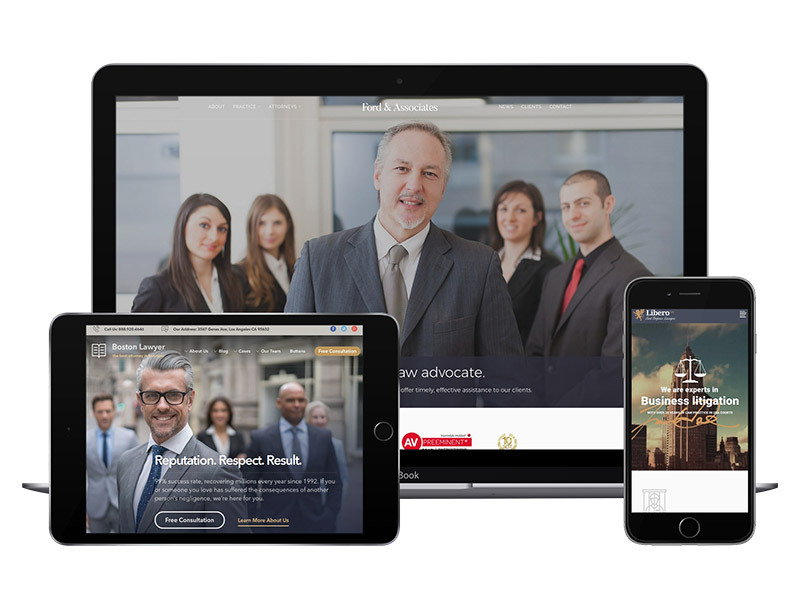 The website your firm deserves. Seamlessly adjusts to phones, tablets, and other small displays. Clean, modern designs that boost conversion and elevate your brand. Optimal load times, even on low bandwidth connections. Designed with SEO best practices in mind. Choose your package and pay via our convenient, secure online checkout. Choose a base design, upload your media, and submit the content for your site. Your first draft will be ready within 10 business days. Review your first draft and provide us with any further instructions. We'll promptly complete your requested changes. After final approval, your new site will go live within one business day. when you add a one year Hosting & Management subscription. Save $500 on web design when you add a one year Hosting & Management subscription. Just $49 per month or $470 if billed annually. Gain peace of mind with our 24/7 datacenter monitoring and a money back 99.9% Uptime Guarantee. Unlimited email addresses, autoresponders, and forwarders. Dedicated IP and DKIM/SPF setup helps keep your outgoing emails out of spam filters. Quad-core processors, loads of memory, 1GB of redundant storage on blazing fast SSD drives, and unlimited bandwidth. We'll provide and install an SSL certificate to enable secure HTTPS connections. Automated backups help protect you against data and email loss. How do I get the $99 website deal? Simply subscribe to our Hosting & Management service for 1 year to get the $99 website special. After 12 months, you're free to cancel the hosting service and move your site to another hosting provider. I already have a website. Can I transfer it to you? Absolutely! Please contact us to learn more. Your site designed to your specifications and preferences, including color scheme, typography, and overall style. We offer a number of templates and examples you can choose as a starting point. What technologies do you use to build websites? We use HTML5/CSS3, jQuery, and the Bootstrap framework. If you choose the Blog addon, with your order, we will build your site in Wordpress. How do I provide you with my files and design instructions? You can upload files, provide design instructions, track the status of your site development, and message our development team from your user dashboard. What if I'm not happy with my site? Our 100% Satisfaction Guarantee is simple: If you wish to cancel after reviewing the first draft of your site, you'll receive a full refund, including a refund of any addons and web hosting services associated with your order. Unlike agencies who bill as many hours as possible, we're all about efficiency. To speed up development, we use pre-coded content blocks, modern responsive frameworks, and a streamlined project management process. Should I use Wordpress for my site? If you plan to frequently blog or post new content on your site, Wordpress may be a good idea. Otherwise, Wordpress is not recommended. Can my site support multiple languages? Yes! Just provide us with the translated text, and we'll create alternate language versions for your site. As multi-language support is beyond the scope of our flat price web design service, you'll be billed at $40/hr in 15 minute increments. There's a custom feature or third-party integration I want on my site. Can you do it? Absolutely! Our development team can handle custom programming and third-party API integrations. Just send a request for quote with as much detail as possible, and we'll let you know our estimated time and cost. Who owns the work product? Upon satisfactory completion of the Services, you own the work product, including source code. While you're free to resell our web design services (as either an affiliate or as a white label solution), we currently don't offer any white label hosting solutions. What is a web host, anyway? A web host sets up and maintains the server that stores your website content, and delivers it to visitors on demand. Your web server also sends, receives, and stores email, among many other functions. Does the cost increase after my first year? No. Your cost remains the same for the life of your service agreement. Can I host my new website elsewhere? *Our standard sites will work out of the box with zero configuration required, but Wordpress sites may require a bit of database configuration by your server administrator. Can I use your hosting and maintenance service for my existing website? In most cases, yes. Depending on your old server's configuration, we may charge a nominal migration fee. To learn more, contact us. What is your 99.9% Uptime Guarantee? Server availability 99.0% - 99.9%: 5% of monthly fee credited. Server availability 98.0% - 98.9%: 10% of monthly fee credited. Server availability 95.0% - 97.9%: 15% of monthly fee credited. Server availability 90.0% - 94.9%: 25% of monthly fee credited. Server availability 89.9% or below: 2.5% credited for every 1% of lost availability, up to 50% of the monthly fee. I already have an email server. If I use your hosting service, do I have to switch? No. You can use our servers solely for your website, with no change to your current email setup. Can my server run Microsoft Exchange? At this time, we only offer Linux servers, which do not support IIS or Exchange. However, your mail server offers IMAP or POP3 email accounts, which can be used with Outlook, Thunderbird, or any other desktop email client. You can also access your email accounts right from your browser. Can I use Microsoft Office 365 or Google Apps/Gmail for email handling? Absolutely! These services can handle your email, you must simply change your domain name's MX record to point to Microsoft or Google's servers. How do I manage email addresses, forwarders, and autoresponders? How do I update my site once it's live? You have full access to your site files. If you'd like us to make the changes for you, simply submit a support ticket from your account detailing the changes you want to make, and we'll respond with a time/cost estimate. What about security patches and updates? If your site is built on Wordpress, we will automatically perform Wordpress core updates, ensuring that you have the latest stable version at all times. If you're using another content management system or third-party framework, you will be responsible for security updates. Does the web hosting cost increase after my first year? Do you offer discounts for multi-site orders or repeat customers? We'd love to offer discounts, but at these prices, we just can't afford to! Absolutely! We handle payments via by Stripe (PCI Service Provider Level 1 Certified). Your credit card is not stored on our server at any time, and payments are always handled over an encrypted HTTPS connection. You can easily update your card on file from your billing dashboard. Where can I view invoices and receipts? You can view billing and order history from your account. And for any successful payment, you'll receive a receipt via email. How can I cancel or modify services? Simply submit a support ticket from your account letting us know what you'd like to do. Our web design service is backed by our 100% Satisfaction Guarantee. There are no refunds on any other services, though you can cancel without penalty at the conclusion of any contract. We do not issue pro-rated refunds for hosting or other services. Who owns the website work product? Upon satisfactory completion of the Services, you own the work product, including source code. Unlike other services, we don't try to hold your website hostage. What do I get in writing? We generate a detailed Web Design Service Agreement and Web Hosting Agreement (if applicable) with each order. A PDF of the e-signed agreement is available for download in your account dashboard. Note that pricing and service descriptions may differ, based on any addons you choose. You will be able to view your full customized agreement before completing checkout. Friendly agents are available via live chat, email, or phone.